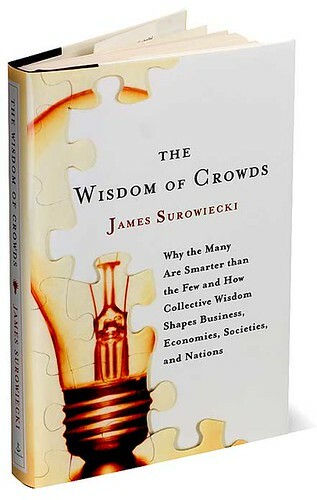 By now most people are familiar with crowd sourcing and/or have heard of or read "The Wisdom of Crowds" by James Surowiecki. As an advocate for crowd-based decision-making, the book sang to me. It seemed to validate a lot of my suspicions, and frankly, my company Fantell is predicated on the notion that crowds are more accurate than individuals. I had never really thought about crowd wisdom in the context of sponsorship marketing. Then, this past week I received an email from my Congressman that got me thinking. Basically, Rep. Mike Honda solicited mock-ups for a re-design of his website, and instead of choosing the design he wanted, he asked his constituents to vote on the design they wanted. Not only did the crowd develop the concepts, the crowd made the choice. Knowing how egotistical and hardheaded a Congressman can be, it was pretty refreshing to see mine be so open to the notion of letting others decide what is best for them. Next thing you know, Congress will pass the single payer health care well over 60% of the electorate wants. But I digress…back to the point. This email from my Congressman made me wonder if crowd sourcing could be used in sponsorship, and if so how? Could it be to get peers to provide advice on how to solve problems? Could it be activation ideas that get property crowds to participate in a way that benefits sponsors? Let’s see what the readers of this blog have to say. Come up with your ideas for how you think the principles of crowd decision-making can be applied to sponsorship marketing and throw them out for other to see. Who knows, maybe the next big idea is out there lurking within us, and it just needs a little bit of crowd wisdom to validate it. So get those synapses in those brains firing and post your ideas! ?